Veilige Veste, which means "safe fortress" in Dutch, is a three-story renovated office building in Leeuwarden, Friesland that has been transformed into a shelter for victims of human trafficking by design firm KAW. 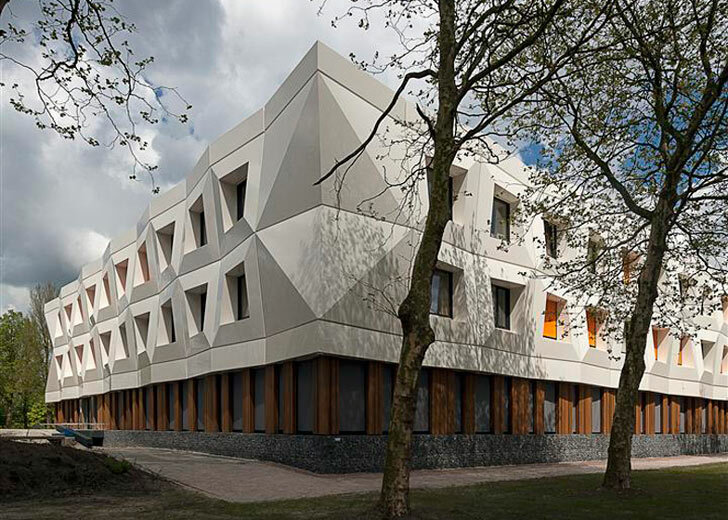 The building, which will provide homes for 48 girls who have been victims of prostitution or abuse, is the first large office building in The Netherlands to be renovated to the Passive House standard. The Veilige Veste building was first constructed in the 1970s as a police station. KAW took on the task to recreate the facade with the new diagonally undulating panels in order to help create a better insulated building and a facade that wasn’t reminiscent of the old police station. The building is designed with office and meeting spaces on the ground floor, while the residences are on the second and third floors. All rooms on the second floor are oriented around a central roof courtyard so that the girls can feel secure while being outside. The major design feature that helped Veilige Veste achieve Passive House standards of energy efficiency was the white, diamond-cut panels that wrapped the upper two-thirds of the building. The old police station was very poorly insulated and consumed an enormous amount of energy during the Netherlands’ harsh winters. Therefore, these new panels, which are 3 feet thick in some places, add layers of insulation and help to draft-proof the building. The building is now outfitted with highly energy-efficient HVAC equipment, thus making it consume very little energy. KAW took on the task to recreate the facade with the new diagonally unjulating panels in order to help create a better insulated building, and a facade that wasn't reminiscent of the old police station. The major design feature that helped Veilige Veste achieve Passive House standards of energy efficiency was the white, diamond-cut panels that wrapped the upper two-thirds of the building. The white facade on the second and third story outline each room individually by framing the deep, inset windows. 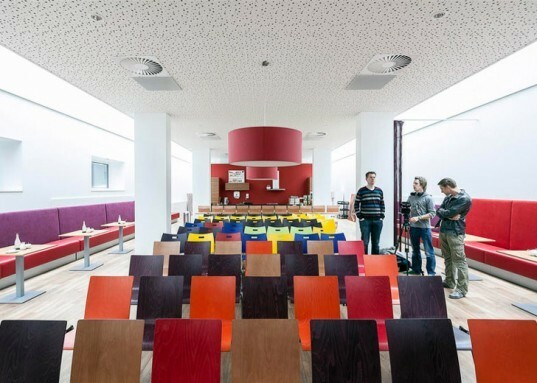 The first story is made up of meeting rooms and living areas. The Veilige Veste building was first constructed in the 1970s as a police station. KAW took on the task to recreate the facade with the new diagonally undulating panels in order to help create a better insulated building and a facade that wasn't reminiscent of the old police station. The building is designed with office and meeting spaces on the ground floor, while the residences are on the second and third floors. All rooms on the second floor are oriented around a central roof courtyard so that the girls can feel secure while being outside. The old police station was very poorly insulated and consumed an enormous amount of energy during the Netherland's harsh winters. Therefore, these new panels, which are 3 feet thick in some places, add layers of insulation and help to draft-proof the building. The building is now outfitted with highly energy-efficient HVAC equipment, thus making it consume very little energy. The interior are vibrant with many different colors. The white background on the walls, floors, and ceilings provide a bright environment, while the colors break up the sterile task of rehabilitation that the facility has undertaken. Activity rooms and living spaces inside the building allow for the girls to socialize an a secure and controlled environment.